scissors and glue in action! 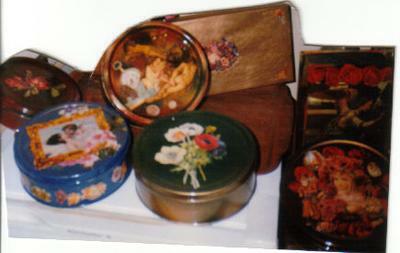 some of the decoupage gift tins I practiced on! 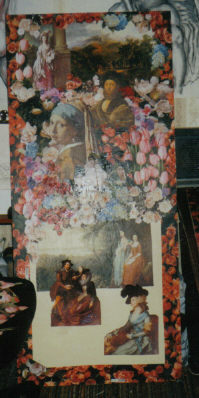 This was a project I got the idea from a set of screens I saw at Mietta's at Queenscliffe when I stayed there. It is a simple concept of classic portraits set in a field of flowers, and I just loved it. So I grabbed a couple of old sliding doors from a wardrobe and set about making them. 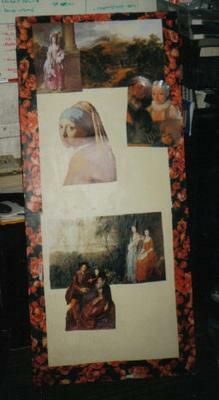 Click on the image thumbnails above to see the stages as I made the decoupage layout etc. for the screens. I still have these, but one is a bit sun faded now *bummer* but they still look good overall. 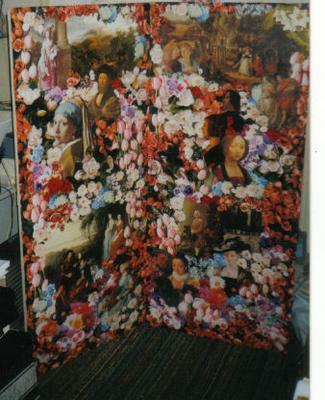 Made these in 1999 when I first learned decoupage and went crazy with gift tins, doll house, wardrobe, and these screens. It was the year I came back to Maryborough after working and living in Melbourne again for 18 months... I was sooooo homesick every day away from here, and as soon as I got back home I started creating crafts like these, I was so happy. Broke - but happy, lol!